One of a number of remarkably preserved concerts at the Library of Congress this recital is one of the most distinguished and important of CDs. It contains the entire recital of 13th April 1940 given by Szigeti and Bartók under the auspices of the Elizabeth Sprague Coolidge Festival. If our understanding and knowledge of Szigeti�s art is not radically altered nevertheless the musico-aesthetic complexities of his partnership with Bartók are rich and the light it shines on Bartók�s pianism is fundamental. The two musicians had given recitals together since the mid-1920s � in Budapest, Berlin, London, Oxford, Paris, Rome and New York. Both had recently emigrated to America � though Bartók was to make one final trip home � and were central members of the Hungarian intellectual diaspora. The bulk of Bartók�s recordings were collected by Hungaroton but as the notes aver his status as a composer has always � even in his own lifetime � eclipsed his prominence as a pianist. He was widely active as a piano soloist however and this Washington concert is one of the most precious documents of his playing. Szigeti�s opening flourish of the Kreutzer Sonata is dramatic and very slow whilst Bartók�s first entry shows one consistent feature of his playing � and many other pianists of an earlier generation � that of breaking his chords by playing the left hand fractionally before the right. When Szigeti joins there is some noticeable roughness in his tone but by 5�28 there is a lightly treading ease of execution, Bartók�s left hand correspondingly delicate, Szigeti gradually lightening his tone. At 7�10 there is a tremendously emphatic episode from Bartók with a sense of overwhelming and evolving drama emanating from both performers. Szigeti is adept at thinning his tone in the interest of tonal contrast to such an extent that we can hear the traces of his oscillatory vibrato. The pizzicato episode launches a "struggle and resolution" passage and this is emblematic of the performance as a whole � it is a ceaselessly imaginative but powerfully projected dramatic canvas. In the slow movement Bartók begins by rolling his chords � an expressive device he employs to noticeable effect - and observe some considerable dynamic gradients. His introductory passage is therefore marked by peaks and troughs in the syntax with heavily accented paragraphs. Szigeti�s sometimes rather dry tone does thin now and then though it�s constantly illuminated by quicksilver phrasing. At the grand restatement by the piano (again unsynchronised hands by Bartók) there is an almost operatically introspective depth to the playing � and Szigeti�s attacking note at 9�49 has to be heard to be believed; I�ve never heard such a devastatingly wild moment from him on record. I found it constantly illuminating to listen to the violinist�s pervasive portamenti here � they are very precise and discreet and never decorative or ornamental but rather almost emotional-structural in effect. The finale begins as something of a divertimento after the sturm und drang of the first two movements. 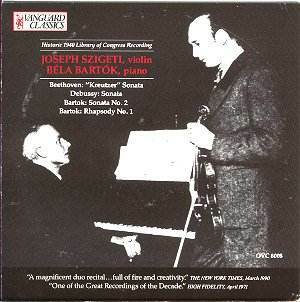 Bartók�s runs here are noteworthy as is Szigeti�s eloquent phrasing at 2�47 et seq. Both musicians coordinate dramatically reduced dynamics here before opening out with sharply attacked and accented playing. It�s true that Szigeti�s technique comes under considerable pressure two thirds of the way through but against that there are tremendous individual subtleties of rubato, rolled and broken chords and articulation to admire in a performance that overwhelmingly explores the dramatic impulses of this peak of the Concertante literature. The little Bartók Rhapsody features some pellucid playing from Szigeti and gleaming Bartok right hand articulation in the first movement marked Lassu. The transformative second, with its array of folk song influences and the uncanny resemblance to the Shaker song Simple Gifts, has surely seldom received such a delicious performance, one which blends simplicity with acute intellectual and structural awareness. The Second Sonata was premiered in London by Bartók and Jelly d�Aranyi in May 1922. He and Szigeti performed it often and Szigeti noted in his autobiography With Strings Attached that he and the composer made a point of playing it at all their recitals. One reason was presumably its complexity and difficulty that has meant that the work is resistant to easy analysis. It goes without saying that its contours are delineated with clarity and meticulous understanding. Szigeti is guilty of some bouncing bow in the first movement but in the Allegretto Bartók�s percussive left hand incites his partner to playing of the highest acuity. At 3�40 Bartók plays the slowing pulse with almost hypnotic intensity and Szigeti�s folk fiddle episode is fiendishly convincing. The monumental conclusion, with Bartók�s piano cascading and Szigeti fiddling very high up, is a dramatic end to a traversal that embodies the intense collaboration of performer-composer and dedicated interpreter. The other work recorded that day was the Debussy Sonata. Szigeti hasn�t the tonal opulence and sensuality of Thibaud here; his tone is much thinner but his sensitivity is no less involving. Bartók is rhythmically alive and constantly illuminating � it may come as a surprise to realise that he considered Bach, Beethoven and Debussy as the three composers from whom he learned the most. There is a living grandeur to the playing and in the Intermède febrile Bartókian piano and delicious Szigeti portamenti. There is nothing understated about the playing nor does the performers� obvious respect and admiration tempt them toward the lax. As I said this is one of the most decisively important sonata recitals on record. Its survival is owed to Harold Spivacke, Director of the Music Division of the Library of Congress, and its continued place in the catalogue in Vanguard�s exemplary production is a matter for rejoicing.